“ Journal of Polytechnic of Gazi University”, which includes both experimental and theoretical studies in basic engineering areas, prioritizes publication of articles on rapidly developing fields of engineering and aims to focus on interdisciplinary methods and technologies and to convey the latest scientific and technological developments in engineering science to researchers, engineers and related masses. Scientific studies submitted to the journal must not be in the evaluation phase for publishing elsewhere as published or oral or poster presentations. 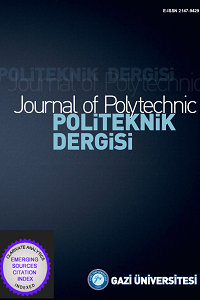 “ Journal of Polytechnic of Gazi University” concentrates on original researches about engineering and technology. Original researches and scientific reviews in engineering and technology fields are considered for publication in this Journal. The publication languages of the journal are Turkish and English. Manuscripts previously published in another journal are not accepted. Practical and theoretical studies are appropriate for this Journal. A review article is expected to give in-depth information and satisfactory evaluation of a engineering subject or technologic development, supported with an extensive reference list. Also, Short communication notes may be published in this Journal. These notes include a new method or technique, which can be explained important conclusions of a investigation.